At the turn of the 20th century, much of the frontier mentality that Waco was founded on remained. At the time, in the early 1900s, Waco – the so-called “Wonder City” – was a sleepy, yet prosperous town with a population of about 30,000 people. It's estimated that half that amount, around 15,000, would gather to witness the "Waco Horror." Around sundown on May 8th, Lucy Fryer, the white wife of a cotton farmer in nearby Robinson, was found clubbed to death, sprawled across the doorway of the farm’s seed shed. It was a grisly scene that included signs of sexual assault. Officials determined a blunt instrument was used as the murder weapon. Suspicion fell almost immediately on Jesse Washington, an illiterate black teenager who, with his brother, had been working as a hired hand for the Fryers for several months. By that evening, Washington was arrested. He was found wearing a bloodstained undershirt and pants. After his arrest, Washington was moved to the jail in Hillsborough. McLennan County Sheriff Samuel Fleming did this after hearing rumors of mob violence, says local historian Rick Fair. “In this initial interview they did with Jesse, he denied all involvement. He said, “I didn’t do it.” Throughout that night, that early morning of May 9th it seemed like there was some pressure from sheriff Fleming and the Hill County sheriff, a guy named of Fred Long", Fair says. " 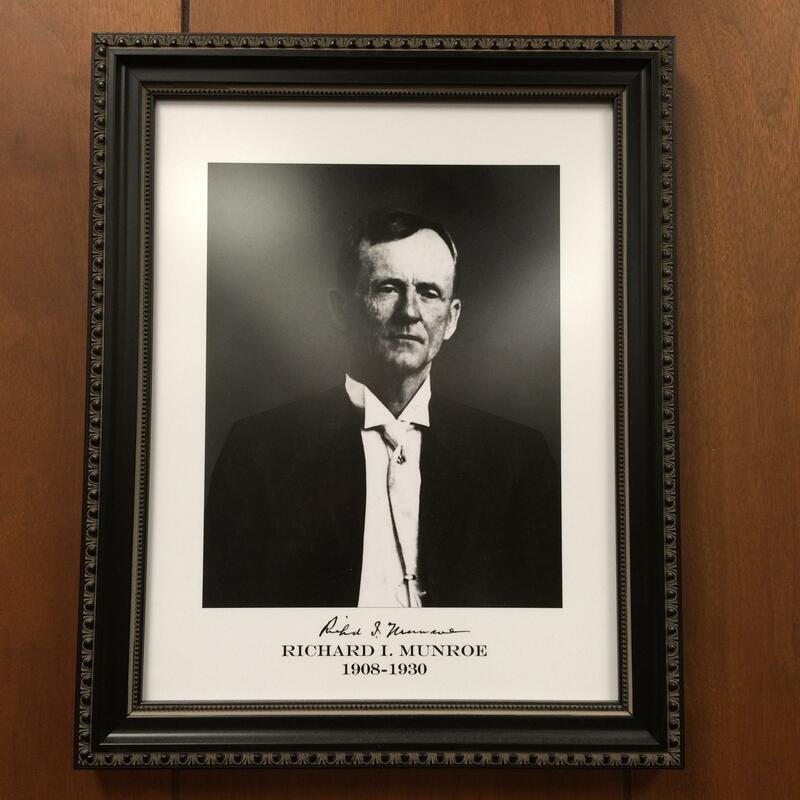 William Munroe was the 54th district court's second judge. He presided over the trial of Jesse Washington. 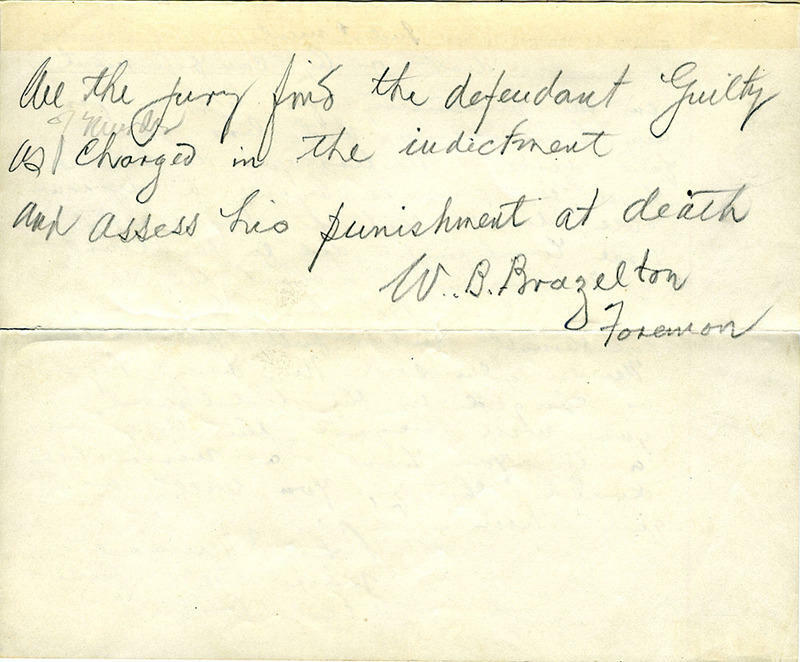 It was only a week after the murder of Lucy Fryer that the trial of Jesse Washington began in a packed courtroom, presided over by Judge Richard Munroe, at McLennan County Courthouse. Jury selection and preliminary procedures went quickly and the prosecution’s case included testimonies from the medical examiner, deputies, and an investigator. But before the trial even began, someone attempted to murder Washington in the courthouse and was eventually subdued. For the defendant, only Washington himself took the stand, relating that he had nothing more to add. After an estimated 4 minutes of deliberation, an all-white jury returned a guilty verdict. In the wake of the verdict, the room erupted violently, and although accounts of what happened in the courtroom vary, ultimately, a group of men seized Washington and quickly exited the courtroom. The iron staircase that Jesse Washington was dragged down rests behind the 54th district court dais. The stairs open into an alleyway, and as Washington and his captors emerged on the back stairs of the courthouse, they were met by a mob, people that that had gathered in downtown Waco for the trial. Harold Lester Goodman, who witnessed the event as a teenager, remembered the event vividly in a 1977 conversation with the Baylor Oral History Institute. 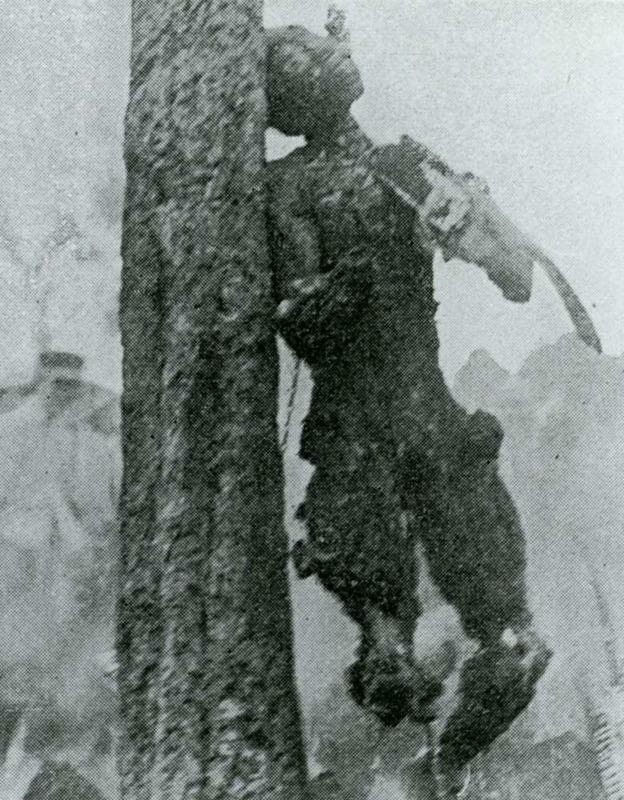 Next, a chain was thrown around Washington’s neck and he was dragged to a site just outside city hall where others had gathered to construct a pyre. As the crowd pushed toward the location, individuals stepped out from the masses to attack Washington, tearing the clothes from his body, stabbing him with knives, and battering him with bricks, clubs and shovels. Soon, more and more began to join. "There was a lot of screaming and hollering and screams of get him, get him. And then there were screams of we've got him, we've got him. It's something I've had some nightmares about it in my lifetime." Kurt Terry, a graduate student at Stephen F. Austin State University, has researched the "Waco Horror. Terry says the crowd that gathered downtown began to swell in numbers. As Washington’s body burned, his body was further dismembered. Onlookers searched the ground for souvenirs, and some even took pieces of his body. By mid-afternoon, little was left of Washington – all that remained was a charred skull and torso. "No attempt was made to stop them from dragging his body. I supposed they figured the man was dead, and the authorities thought it would simply inflame the situation and create a real riot or something", said Goodman. "So they just let it die down." Fred Glidersleeve – who documented much of Waco’s history through his photography – took pictures of the lynching, and the photos remain some of the few documented instances of a lynching as it happened. At the time, some began to use the photographs as postcards. After Washington’s remains were gathered, they were placed in a cloth bag and pulled out to Robinson where they were displayed outside a community blacksmith shop. Later that afternoon, officials retrieved the remains and they were turned over for burial in an unmarked pauper’s grave. Soon, the news of the lynching of Jesse Washington had spread throughout the state and across the world, says Patricia Bernstein, author of "The First Waco Horror." “Two days after the lynching, the story of Jesse Washington appeared in the Times of London – a one-line item, and I believe it was on the front page," Bernstein says. 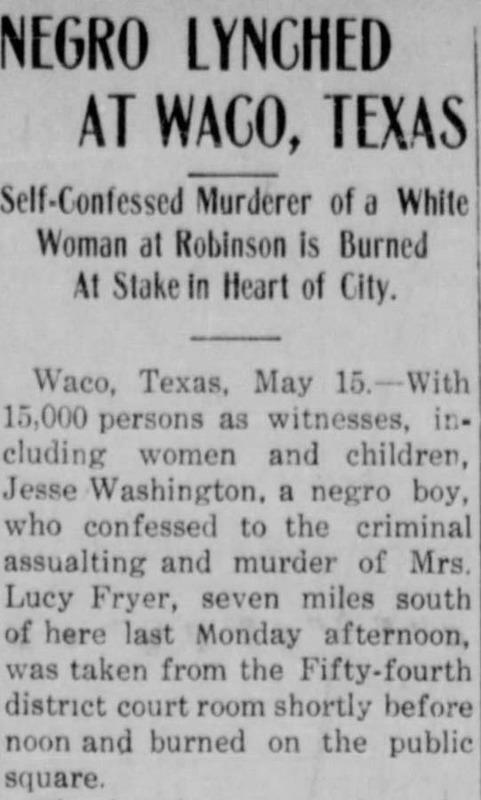 In the days following the local paper deemed the lynching a “closed incident". Domestic coverage was varied, says Bernstein, as black newspapers admonished the event and others delivered editorials failed to condemn the horror. "Of course there was a lot more extended domestic reaction, and the one that stayed with me is the Houston Chronicle, which published an editorial, which basically said – and I’ve never forgotten this – ‘they did such a thing in the cultured, reputable city of Waco, men will say why should not we do likewise'", Berinstein said. The story of Jesse Washington along with Gildersleeve’s pictures was also printed in “The Crisis” – the magazine for the NAACP. The group had sent Elizabeth Freeman, a young white woman, to investigate and report on the event. Freeman’s findings became part of the NAACP’s national campaign for anti-lynching legislation. For Locals -- both black and white – the lynching of Jesse Washington wasn’t a “closed case” after all, it’s legacy would echo through the next hundred years.